I really don’t have much of a story to share about these burgers, other than that I made them and they were really friggin’ good. My favorite form of procrastination is browsing food blogs for culinary inspiration. The other day I stumbled upon a recipe that looked a little something like this one, only a lot less awesome. 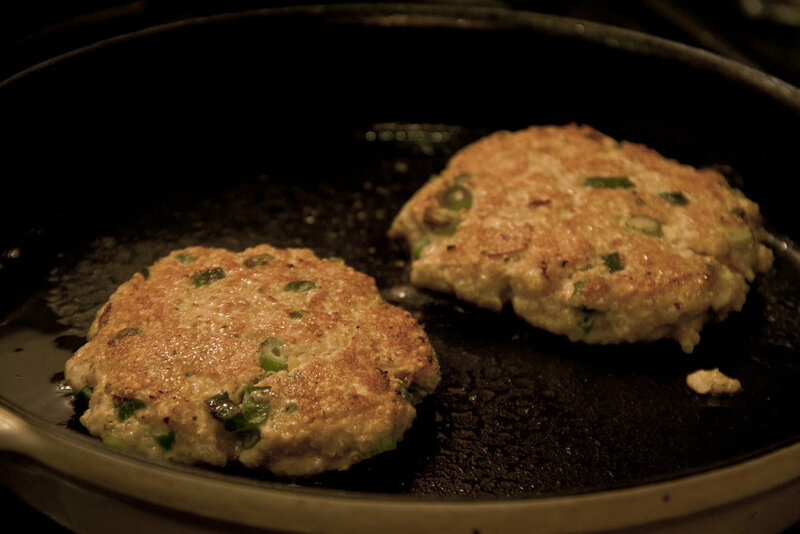 It was actually a pretty weird recipe, but I liked the idea of putting quinoa in turkey burgers, so I ran with that. The result was these really flavorful and juicy burgers. With garlic, scallions, sesame oil, and red pepper, there’s no dearth of flavor here. The quinoa makes for a nice crunch on the outside, and a moist inside. Egg, quinoa, and lean turkey make this a protein packed meal, especially if you opt for low fat turkey white meat. Like I said, not much to say here, other than that you should hurry up and give this recipe a try. You’ll never go back to plain old turkey burgers again. 1. Bring quinoa and water to a boil in a small pot. Once boiling, turn heat down to a simmer and cook until all the water is absorbed. 2. While quinoa is cooking, slice scallions and finely chop garlic. 3. Once quinoa is cooked, let cool for five minutes. Then combine quinoa, turkey, garlic, scallions, red pepper flakes, sesame oil, egg, salt, and pepper. It’s easiest to do this using your hands. 4. Line a cookie sheet with tinfoil. Using your hands, create 4 3-inch patties and set aside on tinfoil. 5. In a cast iron or other sturdy skillet, heat canola or grape seed oil until very hot. 6. Cook two burgers at a time, flipping after about four minutes. 7. If desired, add cheese when burgers are almost finished. Cover pan until cheese is melted. 8. Serve on toasted bread with your favorite toppings or plain, alongside a salad.